The following transcript from my talk at Now What? Conference 2015, “Small CS: A Shoestring Approach to Content Strategy” (April 30, 2015), has been edited for clarity and to replace things misspoken during the talk. Do not fear, though. The professional wrestling is still there. We are a small agency, and we don’t necessarily have the budget to hire someone to fill every single possible position. So I do a little bit of content strategy, I do a little bit of information architecture, I work on site QA, I work on site copy. I used to be the guy who bought beer. These are the things that I do because we all need to wear a lot of different hats when we work within a small organization. And I’m going to talk today about how we can take big concepts like content strategy and boil them down into smaller, more manageable tasks, so it doesn’t seem so incredibly overwhelming when we look at it with our two-person marketing staff, or our very small budget. I’m excited to be here, because I really like talking about methodology. It’s a really dumb thing to like talking about, but I think it’s really interesting that so many of us have very similar goals, but we can go at those goals from so many different angles. And I’m also excited to be up here because it’s fun to share this stage with some fantastic people. But, I’ll be honest, mostly the reason I’m excited to be up here is because I want to talk about the most important event that ever happened in the Detroit Silverdome. 92,000 people filled the Detroit Silverdome that day—it was a record for a sports event. Sorry, a “sports” event. And it wasn’t broken until 2010 when the NBA All Star Game showed up at Cowboys Stadium. And sure, while people were there to see a 12-match lineup, no one really cared much about the Can-Am Connection, and nobody cared about Lord Littlebrook, and really nobody cared about the Honky Tonk Man—people were there to see one match: Hulk Hogan vs. Andre the Giant. This was the 80s, and we were obsessed with size. These guys were big—they stole headlines, they pulled people in. Children saw larger than life giants. Adults suspended their disbelief long enough to actually wonder whether or not Hulk Hogan—the champion—could bodyslam Andre the Giant. This was as big as it would get. But this isn’t about Andre the Giant. This isn’t about Hulk Hogan. This is about a match that happened a little bit further up the card, between two people who had nowhere near the size of Andre and Hogan. This is about Ricky Steamboat vs. the Macho Man Randy Savage. Ricky Steamboat and Randy Savage were small compared to the rest of the wrestlers—they could not get over on size alone. So they used their smallness as an advantage—they were faster, more athletic. At the end of the day, while Andre and Hogan got all the headlines, Savage vs. Steamboat stole the show. This is the match that people still talk about. So your speaker is on stage talking about wrestling. Now What? Well there is a moral to this—being small doesn’t have to be a disadvantage. Content strategy isn’t a big budget, big project type of discipline. It can work within our existing restraints, it can work within our existing teams. We just have to talk about the things we do to make it smaller. So I want to talk a little bit about that today—both what we can do to make it smaller, and then the little tasks we can do within our process. But first I want to talk a little bit about the history of content strategy and why this is even an issue. The history of content strategy isn’t much of a history—yes we’ve always been talking about content and yes, these are things that we clearly need to pay attention to. But we’ve always had a really hard time selling it—as a consultant and within our organizations. It was hard to say, “We would like to put a little bit more time toward making sure our content is really really good.” There was no “product.” There was no tangibility. And so we tried to sell it in two ways. First, we sold it based on deliverables. Deliverables are things that you pay for—we can give a deliverable to someone, and they understand what it is they paid for. 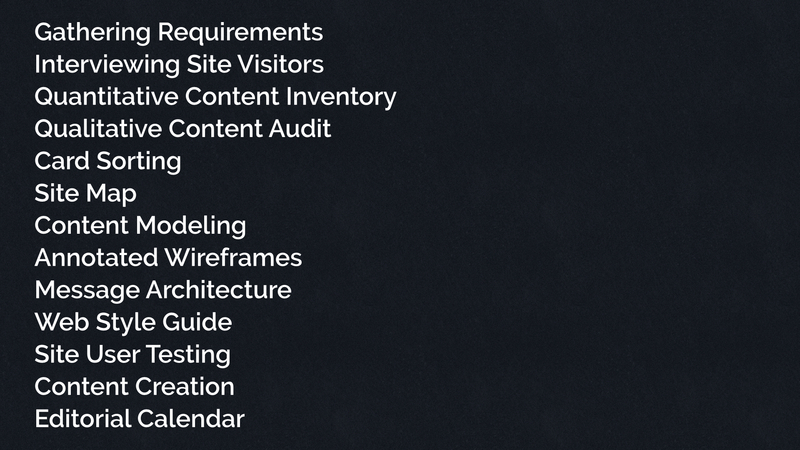 When you get a content audit —it’s easy to understand what you spent a bunch of time doing. But content strategy isn’t always necessarily deliverable driven. A lot of times we’re in there helping other teams find their way. So then we defined it by using big names and big budgets. We talked about case studies. We talked about NPR. NPR had a gigantic content distribution model and every body really likes hearing that story. That’s a great story. We talk about the Boston Globe. We talk about a project that took a traditional media source and brought it into the future through responsive design. We talk about both Obama campaigns. We talk about what looked like a grass-roots effort, built on the foundation of a streamlined, well-oiled machine. We talk about companies like Marriott, where there are hundreds of different individual locations being pulled under one umbrella. The downside to these kinds of case studies is that most of us can’t do what these companies are doing. The downside is that this makes everything look like it’s tied together really nicely. Like this is a great little package that you can go pay for. Let’s go get a content strategy. In reality, that’s not how it is. Case studies are fantastic: they’re the currency of change management and process management. When we write articles it’s crucial to have a great case study—it gives you a fantastic example. But case studies are just that: a large package, tied together, where everything ends up perfectly. We don’t see what happened before. We don’t see what’s happening after. Not to mention we don’t get to see the individual pieces. There are so many things that go into changing our web content and keeping things updated. We look at it like we’re going to get a packaged solution, but really we’re doing hundreds of things: interviewing users and asking questions and finding silos and breaking them apart, and adding processes and adding people—or getting rid of processes and getting rid of people. Or we are doing a content audit or content inventory, organizing all the site content on the site, writing copy, editing copy, adapting that copy so that works in different formats, sharing that content. These are all the little things that make up the larger idea of content strategy, and that’s not even talking about the slow and onerous crawl of cultural change. So it helps to remember that when we hear these big stories, they don’t necessarily represent what content strategy is. What it is, is a larger process. And processes are nice because we can fit them within what we’re already doing. They aren’t something that require a block of time—they’re something that can just become a part of what we do. Because that’s not going to fit in with your culture, and it’s not going to fit in with your organization. You may have to go smaller. You may have to leave things out. So what’s stopping us from doing that? What’s stopping us from saying “Let’s just go do some great things. Let’s do everything we possibly can?” If we dream big, we’re going to be able to everything right? No. This dog is stopping us. This dog represents the universal limiting factor of every project. And that’s budget. I don’t like this dog. None of us like this dog. This dog bites at our heels, this dog pees on our carpet, this dog is a general nuisance. But it’s there because we got it as a gift. And we can’t get rid of it because it holds some sort of sentimental value. And let’s be honest, at this point, budget is a size-agnostic issue. Larger companies work with budget limitations as well, the only difference is that they have a bigger budget so they can do more. We’re also talking about attention. We’re talking about priority. Where does this fit in the grand scheme of things that we have to do for our website. Where does content strategy fit? How many people have seen these square watermelons? 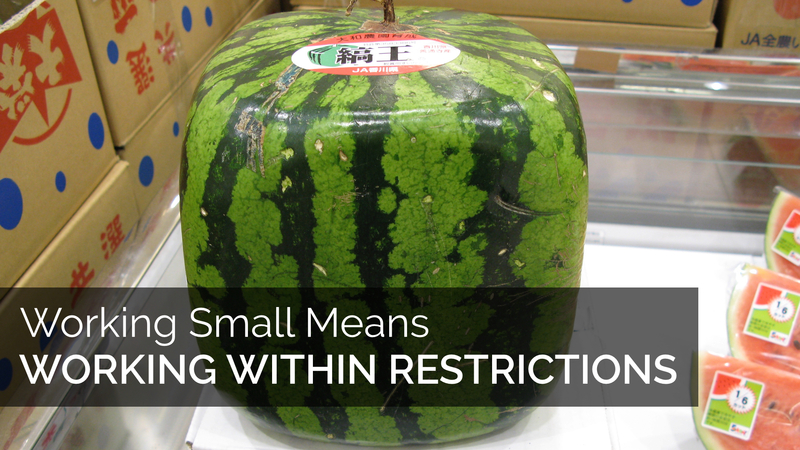 This is how you make a square watermelon: you take a small watermelon about this big and you put it inside a plastic box and the watermelon grows and grows like it’s supposed to like watermelons do. Eventually it gets to a point were it’s touching the sides, and at that point, if we were that watermelon, we would have to start making a decision. Is this as big as I’m going to get? Or am I gonna change what I am—a round watermelon—and give up that dream to get a little bigger and become a cubed watermelon. That’s what we do as a small business, or as a non-profit organization. Every time we make a change we have to account for that change someplace else. Every time we have some level of success we have to look at that success and determine whether or not we can adapt to that—do we continue doing this or do we move on and say, “Okay—we won that one.” We’re constantly changing priorities, and we are constantly looking for ways that we can scrimp and save. So I want to talk about working within these restrictions—not working within glass boxes, but working within the budget. And we start with what seems like a really obvious one—the project scope. The first question I usually get when we run into a new project is, “What exactly will we be doing as part of this?” Because when people look at what content strategy is, or when they’re working with any sort of content on the web, they have an idea—they have read some of those books, they have seen some of the speakers today, they have read those case studies, and they want to know how we are you going to do all of that stuff within a much smaller budget? At Blend, we remind them that we don’t necessarily have to do all of the things. You’re not doing content strategy wrong if you’re not doing every single thing you hear. This is a very small list of all the things you could possibly do. This list could be hundreds of items long, but it was too hard to type all of that. When we look at this, this may be what you think of as “content strategy”. But to a university that’s looking to write some new case studies or testimonials—a small project to focus on in between the larger content projects like a course catalog or graduation—you may only need a few of these. Same for a company that sells farm equipment, if their focus is readjusting the content model and updating the tags so that search works better. For a non-profit that’s starting a brand new website, the scope may again be totally different. There’s this idea that current scope has to be future scope—that we have to be doing everything right now that we’re possibly planning to do in the future. And really, that doesn’t work. We don’t have time to do everything at once. 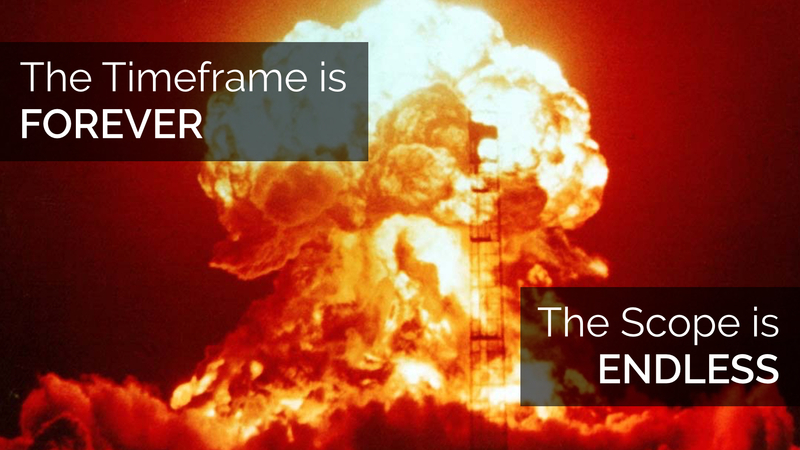 We have to go away from the idea that there is a timeframe for our website—that there is an idea of project scope. The process will be around forever. And ever. And ever. Until the sun collapses in on itself and we all die in a giant explosion. That’s when we can finally stop. That is the point in which our website is finished. So waiting until we have all the budget or waiting until we have all the time isn’t going to work—we just have to start doing stuff. We can have a timeline. We can say, “these are the things we want to get done,” and we can group things into scopes, but the idea that we’re going to be finished at some point—that we have to try to fit everything in at once—that’s not realistic. 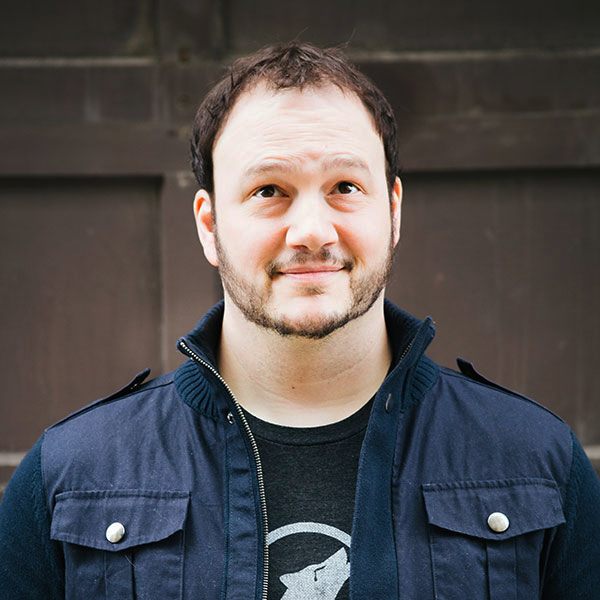 We have to start thinking about what our minimal viable product is for content strategy. So when clients want a really highly customized site, with the ability to give a personalized message to everyone who shows up, I ask if there is someone who can do that—is there someone in the workflow who can spend time in the content management system actually putting all of those different attributes together into groups. If you have a two-person marketing team, you don’t have the people to do that. Can we import and migrate hundreds of years of PDFs into HTML? And by the way, this launches in three months. Probably not. There is one part, though—and this maybe the most minimum of the viable strategy—and it was in every one of the scopes we looked at before. And that’s research. The thing is, if you don’t do any research at the beginning, you’re going to pay for that research down the line. You’re going to make mistakes early that get baked in to the site, and when it launches you’ve got to go backwards and fix it. I’m not saying though that research has to be a gigantic, big budget piece. 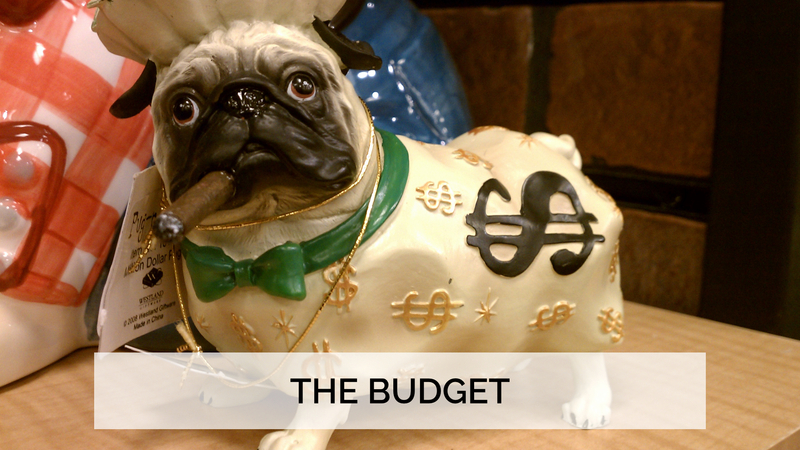 If you don’t have the budget to do research, you just have to do it at a much smaller level. Instead of flailing in the dark, instead of punching at shadows, we would at least know a little bit about what we’re trying to build a site for. The first is gut checks. When we talk about gut checks we’re talking about small, off-the-cuff pieces of research—the idea that we don’t necessarily have to research every individual piece of something. Sometimes we have a gut feeling, and that gut feeling can be okay. You just need to get curious about something. You have to find an audience. And finding an audience is as easy as turning to the person next to you, or walking to the coffee shop, or wandering into the street with a piece of paper asking anybody who wants to listen. You have to ask quality questions. And then, finally, you have to choose a direction. Make a decision based on what you found. There could be hundreds more questions, but the idea is to have three or four that really lead toward what you’re trying to figure out. Maybe you’ll even ask a few questions and find the answers drive you toward better questions later on. The idea of these gut checks is to get a little bit of direction. We’re not going to change our entire process because of one gut check. But this is going to help point us in a better direction. It’s going to help us understand what questions we should be asking. It’s going to help us understand maybe a few things down the line that we don’t need to be worrying about. It’s going to help us prioritize things a little bit better. The second way we can do research on a smaller budget or within a smaller team is to rely—no, not rely, but to use—existing research. Unless we’re in a brand new industry that no one’s heard of, chances are there’s existing research out there—whether it’s a case study, a journal—and we can use that existing research to a point. We might as well—it’s out there. Somebody’s already done that research, we should use some of the findings. There’s a caveat to this—existing research alone can not be enough. We work with a higher ed client that talks about their “five percent.” When they talk about differentiation between their university and other universities—they have given up 95% already. Ninety-five percent of every university is pretty much the same, in terms of marketing and in terms of message. That extra five percent—that’s what really matters. That’s what differentiates you from the other competing universities—your competitors, your contemporaries. With existing research, all we’re getting is that first 95%. We’re not getting anything personal beyond that. For that we still need to rely not just on gut checks, but on face-to-face interactions with users, talking to audiences, and better understanding what makes them that little bit different from everybody else in that existing research. Finally, instead of treating research like something is only done at the beginning, we can add and bake in research to the entire process itself. There’s two ways to do this. One of them is to reach out to the people in your customer service department if you have one or your sales people (if you have sales people) and ask them questions. They’re closest to the people who are going to find out what our users want because they are interacting with their users all the time. The best web projects I’ve ever worked on are projects where I’m working with somebody who knows more than marketing—primarily if they also handle the sales part of things. They are open to changing things for the users. They know exactly what it’s like. What that means is that somebody is coming to your site and looking for your competitor’s equipment, because that’s what they think it’s called. It’s like going to Target and asking for Kleenex and they don’t have Kleenex, they only have facial tissue. Maybe we need to start looking at whether or not that shopping cart process is working. Just kidding. No one ever says that. The important thing to research is that we have to know when to stop. You can research for as long as you see fit—as long as you want to put budget toward it, put time toward it, you can research forever. When you begin to see patterns, though, that’s when it’s time to stop doing research and move on to another project. I’m not saying stop research altogether, but stop researching that specific thing for that specific moment. The time to stop depends on the project, it depends on the process, it depends on the product, it depends on every little thing. There’s no formula for when to stop doing research. And with that click, let’s talk about making things. Creating, maintaining, and editing content is really hard, and it takes a lot of time. But we can’t skimp on it. We can’t go 50% with content quality across our site, because people will notice it. It’s going to look really bad. What we need to start doing is prioritizing that content and finding people who can help us make it. And we’ll start with that first one—prioritizing content means breaking it apart into more manageable chunks. We’re going back to that idea of minimal viable content. Saying that this is what we need to work on because this is what we need to have. Focusing on the sections of the website that have the highest need, updating them really well, and then getting that content out there. Working on the extra stuff later. Carrie Hane Dennison had a talk back at IA Summit in 2011 about content strategy on a shoestring budget, and she compares it to buying furniture for your home. You want to focus on the things that you need, and that’s going to dictate how you update things. Nobody’s going to save all of their money and keep all of their old furniture forever until they get to the point that they’ve saved enough money to buy all brand new furniture, top-to-bottom. There’s two reasons that doesn’t work. It’s really frustrating to have to take all that on, and it’s really stressful. It builds in the wrong kind of attitude. What we want to do is promote the idea of constant change. So we’re not just updating our content because we need to have a new brand—we’re updating our content constantly because we’re paying attention to what needs to be updated. And we’re doing a little bit at a time. Because then it’s not a big weight on our shoulders. These are priorities because our audiences say they’re priorities. Everything else can come after that. So for example, if a university knows that they need to focus first and foremost on admissions content—because they know that once students reach campus they go to the student portal instead—our focus then is to make sure we’re making great copy before they get to campus. If there’s a big fundraising campaign, and you know some of your best donors relate to reading the annual report in print, we need to make sure that we adapt the site so we can have the same content out there for them to view. If there’s a big sale coming up and you have some kind of shopping cart feature you need to make sure that all the help copy is there, that the process is working correctly, that everything is ready for a giant group of people to come through. Sometimes we don’t even have time to make these changes, so we have to patch things together. In the case of the example earlier about the fundraising campaign, one of the main sources is the annual report, and maybe we don’t have time to get that on the website. So we have to just upload the PDF. Our focus shifts: make sure that PDF is still accessible for them to reach. Or maybe we have a bunch of forms, and these forms are very important but we can’t get them set up in HTML so we have to keep them as PDFs. It doesn’t matter in this case as long as we’re providing access. As long as we’re doing something. We see this with organizations that need a mobile site but they don’t have the time or budget to go all the way out and redesign their entire site to be responsive, so they create an m-dot site—a separate mobile site. That can be okay. In fact, Karen McGrane talks a little about that exact example —about how these seemingly contrary decisions it feels like we’re not going forward—it feels like we’re patching things up. And that’s okay. Because we’re focusing on priorities first. It collects aspirational content. — If you have a white board that has a list of all the things you want to get done in the future, it’s really easy to use that list to justify budget—we’ve already listed out all of the different things we really should be doing. It reminds us of what we can do. — The problem with working within a minimal viable strategy is .. that’s just it. We’re working at a minimum. And so we get so heads down in our work that we forget that there are other things we could possibly be doing. It helps remind us that if we do end up with extra people, extra time, extra budget, we can do so many great things. And so let’s talk about what happens when somebody else shows up. There are a lot of different ways this can happen. Our advice when a client comes talks about all of the content they’re ready to place on the, looking for advice on how to handle the bulk of the work, is to ask “do you have more people who can help?” Because if it’s just your small marketing team or if you have to do it within a few weeks because that’s all the attention you have to give to it, it’s not going to get done very well. And so we can start young. We can find an intern. Interns are fantastic because, for the most part … let’s be honest … they are are inexpensive. Or, at least, they’re less expensive than a seasoned practitioner within that field. The other great thing about interns is that they are not entrenched in your organization. They don’t know all of the politics. They don’t even understand all of the content. They have enthusiasm, but they don’t have any of the baggage that comes from working within a company and knowing all of that content. So in addition to having somebody working on your copy, or working on your videos or working on your various content audits, now you have somebody you can ask questions of. They have a little bit of an idea of what you do, by nature of working within the organization for a short amount of time, so you can ask them things about whether or not content makes sense, or whether things sound weird. You can do the same gut checks we talked about earlier with that intern, because they are a perfect balance between the end user and somebody who actually works at the organization. Also, you can find site users. There’s a site called Snapshot Serengeti, which is an open source project created by the University of Minnesota’s Lion Research center. Here’s how you used to study lions: you would drive a Jeep into the Serengeti, and then you’d hang out there for four days. You’d wait to hear a lion roar. And if you heard a lion roar, then you drove over to where that lion is and then you do science. You follow them around for a bit, but you really can’t follow them around too much because it’s a lion. They set up a bunch of motion activated cameras throughout the Serengeti, and they sat back and waited for the pictures to roll in. And they did. Millions and millions of photos rolled in. How do you classify millions and millions of photos? You don’t. You turn them into a game, and you let millions of people do it for you. Snapshot Serengeti, gives site users a set of parameters from which to categorize and classify pictures of animals. You determine the number of wildebeests, and you say what they’re doing, they give you help copy that helps you determine by color or pattern whether or not you’re seeing a cheetah or emu. What happened is that they ended up getting all of this data—not only the tags that were put on them but also the location data from the cameras and the time that the photos were taken—and now they have an incredibly rich amount of data where they can see actual migration patterns. Now I’m not saying anyone in here is going to study lions, but this can be done on a smaller scale as well. We work with an organization that is the keeper of everything related to the Beechcraft Bonanza aircraft style. They have decades and decades of magazines, mechanics guides, operators guides, etc. They are going to put it all on this one site, and they want it to be really searchable. Unfortunately, none of it has any data attached to it yet. Our suggestion was to put together a little bookmarklet so if you’re on a page you can easily assign metadata and classifications. “Yes, this is for the A-37, and this one is a front propeller, and this one has wings.” Their power users will actually get to go through this, and and they’re going to. These are people who really enjoy private aircraft. They are part of a very select group. They are members of an exclusive club. If you want to, give them something in return—give them a free membership or invite them to dinner the next time there’s a conference. Make it seem like a really special thing and you’re going to get all sorts data taken care of. Or you can just find other people within your departments. Get this work pushed off on someone else. Ten people working on a hundred pieces of content is going to take a lot less time than one person working on it—and especially if we’re working on department-specific content. But how do we handle the logistical problems of spreading content all over the place? You no longer have control over everything. So that’s when we have to start talking about governance—who’s going to own this thing, and how are we going to maintain this content in a way that makes sense for our users because we now have ten authors instead of one. A lot of times that sounds like putting one person in charge – making them an editor and letting them lay the smackdown on loose content. That’s a lot of work—one person can’t do that. So let’s take that idea of governance and spread it out over numerous people. Effective governance is a democracy. There are a lot of people working together—it isn’t just one person saying, “Make these changes.” It’s not a dictatorship. If we get everybody involved, it’s no longer a big project that one person takes over and cries over at night. Some attention is better than no attention. Enter the rolling audit. We don’t necessarily have to audit everything all at once. We can just do some of it. And the idea of a rolling audit is that instead of taking a content audit and saying “we’re going to do this now and we’re going to do all of it, and it’s going to be awesome and we’re never going to return to it,” a rolling audit makes it sort of a lifelong process. It bakes it into your existing processes. For an example, we’ll use a university as an example because they have lots of content. We have a team that’s responsible for five sections of the site—Academics, Admissions, Campus Life, Majors and Alumni. Figure out if we need to audit all of this stuff. We know that the majors get fed in through the same system that course catalog is built in. So that content is pulled in through an API, and it is handled by someone else. We will cross that off the list. Break it into smaller pieces. A content audit can take an awful long time, and there are periods of all-hands-on-deck (graduation, course catalog), so dedicating three or four months to a single audit isn’t realistic. So, in our example, may be we just on the academic section in April, and we’ll focus on admissions in June, and we’ll focus on campus life in September, and alumni in November—during the times when maybe we don’t have a lot of stuff going on. Go into details in stages. We’re not going to do a complete content audit, because we don’t want to make this a burden on everyone else’s workload. So for the first round, we’re going to focus on basic content inventory fields, updates, and errors. Next year, we will the future strategic plan. 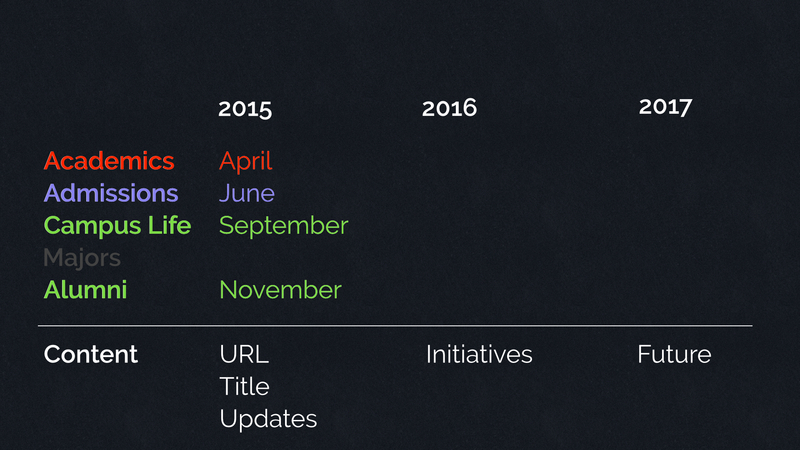 The year after, we’ll focus on how content fits into the future of the website? Yes, this has taken longer. It’s now a three-year process, but it’s a three-year process that fits in among all of the other things that we’re working on. And we can even take that a little bit further—we can start breaking this up and having other people take care of it. So you have one group that’s going to take care of academics, one person that’s going to take care of admissions, and then maybe one person takes care of campus life and alumni. So now, you’re only focusing on one section of the site, once a year. That’s manageable for a team of two or three people. That’s working smart with a small team. There are hundreds of things that you can do with your website if you break things down. Those big examples—NPR, Boston Globe, Marriott—these are awesome examples for understanding the complexity in content strategy. They’re fantastic for seeing how big things can get. But we can make things smaller as well. And, I want to be really clear—I know somebody that works with Marriott. They have the same internal issues that any small business does. Everybody has some kind of content issue that makes it hard to get stuff done. We all have that. The big companies, the small companies. Large universities, small universities. Non-profit, for profit. Do you guys want to talk about wrestling again? Awesome. If you’re a well-adjusted human being, you have no idea what happened to Ricky the Dragon Steamboat. But I’ll tell you. Ricky the Dragon Steamboat won the Intercontinental Title that night at Wrestlemania III. He then went on to switch organizations, where he beat one of the most influential wrestlers of all time—Ric Flair—for the world title. Macho Man Randy Savage lost the belt that night, but he came back pretty strong the next year and won a tournament to become the world champion at Wrestlemania IV. Then, as fate would have it (and nobody saw this coming, because you can’t plan these things) at Wrestlemania V he actually ended up facing Hulk Hogan for the world title, becoming one of the best bad guys in the business. What’s more, tastes changed. Champions became smaller. We realized it didn’t take just a big person to become a champion. In fact, after a while, that got to be really boring. So nine years after Wrestlemania III, two guys named Bret Hart and Shawn Michaels—who combined weighed less than Andre the Giant—fought in a one-hour iron man match for the world title. Ten years later, a five-foot-something luchador named Rey Mysterio, Jr. won the world title at Wrestlemania 22, followed by an even weirder looking guy named Daniel Bryan winning the title at Wrestlemania 30. These … “athletes” … all have one thing in common. They used what they had to do something fantastic. They ignored their weight class. Which brings us back to the beginning—being small doesn’t have to be a disadvantage. As teams better understand how technology works, they become more likely to start using that technology, using those processes. Smaller teams don’t have the weight of a giant organization to try to shift in one direction. They can move nimbly. Being small also makes us sharper. We know what it means when we’re down on chips. It means we don’t have any more room to wiggle. And so we start making better decisions. We start working smarter. Small teams and small businesses and small organizations may not have purchasing power, but they have agility and they can build momentum. They don’t need to swing entrenched company culture. They can just do things. And that’s really freeing. That’s what makes the web such a fantastic place. There are right answers, and there are wrong answers, but regardless—there are a lot of answers. And we can find the answers to make change within our organization. So now let’s go make some change, no matter how small that change might be. Notes, image credits, and other links of interest for this talk were posted here on this blog at http://www.eatingelephant.com/nowwhat2015.